More often than not, an eye injury requires treatment right away. Waiting for medical personnel could take too long and by then the eyes could have suffered some irreparable damage. You have to be ready to provide first aid to some of the more common injuries affecting the eyes. Knowing this type of first aid could mean saving the sight of a victim. Is your workplace equipped to deliver proper first aid to eye injuries? Are your employees trained to respond immediately with the proper techniques? Is the right equipment available on site? Does it contain hospital grade supplies that are well organised so that the module is easy to identify and simple to use in an emergency? If your offices do not have the proper first aid kit or training for these injuries, you need to take immediate action. So without any further adieu, get in touch with the experts. Contact your friendly Alsco representative. Here are some of the more common eye injuries and how you can treat them. There are all kinds of objects that can get caught in the eye. Anything that is small enough can get lodged there and cause damage. First of all, the affected eye should not be rubbed at all. Rubbing can cause damage to the eye surface. You have to prevent children especially, from rubbing their eyes. Anyone who would try to touch the affected eye should first wash hands. If the victim is wearing contact lenses, he or she should take out the lenses. If the object is trapped in the colored portion of the eye try flushing it out with. Ensure clean running water or, just to be safe, use an eyewash station. If the object is lodged in the white portion of the eye, then you can use a wet cotton swab and use it to touch the object. The object should stick to the swab. Make sure that you flush the eye with clean water. An eyewash station is safe. If you have a water dropper, then use that, just make sure that you are using clean water. Never use tweezers or any similar tool in order take out objects that are lodged there. Never try to remove metal objects that are lodged in the eye. That should be done by a doctor or a trained specialist with proper equipment. Apply ice to the affected area for 10 minutes, several times each day. That will reduce the swelling. 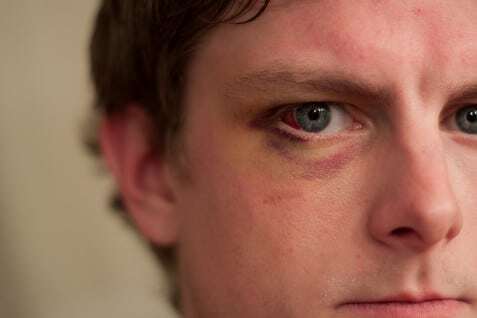 Never use chemical packs in treating a black eye. If the chemical leaks, that can cause injuries. Keep the head of the injured person elevated. That would help in reducing the swelling. The black eye only affects the area surrounding the eye. Be sure to check the eye itself for any injuries. When the swelling has gone down, you should use warm compresses in order to help with the pain. The first step that you have to take when treating a heat burn to the eye is to flush it with cool water. Flush it with water and the victim should close and open his eyes. You can also use a faucet with clean water or an eye-wash station to flush the eye. The victim should move his eyes while it is under the running water. Keep flushing the affected the eye area for half an hour. The flushing with water will help to ease the pain, but the pain may come back when the flushing is done. When done flushing, the injured person should wear dark glasses or use bandages. Ideally, you should use sterile bandages in covering the eye. Pressure should not be applied to the eye when treating it. That can increase the injury to the eye. The first thing that you need to do is to apply clean cloth or bandage to the affected eye area. Do not use cotton bandages because that might fall apart. If the cut to the eye area is minor, then pressure can be applied to it in order to stop the bleeding. You should not apply pressure directly to the eyeball. A cut to the interior of the eyelid could damage the tear ducts and would have to be evaluated by a professional. The first thing to remember when dealing with an eye scratch is that you should not rub it. That can cause further damage. Ensure that the foreign object has been dislodged using the steps outlined above. Simply close the eyes or if you need something to cover it then you can use an eye shield. Getting anything other than clean water in your eye can be dangerous. Some chemicals can cause serious damage that could even result in the loss of sight. The treatment for the chemical burn would depend on the kind of chemical involved. Acids will usually cause a burning sensation and redness to the surface where it would come in contact. The good news is that acid can be washed easily using water. Chemicals that are basic or what are known as alkali can cause more serious harm than acids. Part of the reason why alkali chemicals are more serious is because the person might not feel the pain or seen any redness immediately. Toilet bowl cleaners and oven cleaners belong to this category. If you splash chemicals into your eyes, your first move should be to flush it with water. Put the affected eye under a steady stream of slightly warm water for more than ten minutes. Because the effects of chemicals in the eyes range from minor to the very serious, it is very important that you get professional medical help right away. If possible, call emergency services. These are just some of the more common eye injuries and what you can do in order to respond to them. Ensure that you are properly equipped in dealing with injuries affecting the eyes. Responding to an eye emergency becomes simpler with a well organised eye-wound module in your first-aid kit. The Alsco eye module is designed to do just that. Upon opening the clearly labelled box, you will find two gloves right on top that should be worn in order to avoid any further injury or cross-contamination to the eye. After the gloves, there is a pair of eye wash, which allows the first aider to flush the eye. Flushing the eye is the safest way to dislodge foreign matter, whether chemical or particulate matter, from the eye. The item found next is the eye-wipe, which is to be used in case the foreign matter fails to get removed by flushing the eye. The magnetised eye-wipe attracts metallic substances towards itself in order to remove them. Below the eye-wipe are a pair of eye-pads, which are to be used to allow the eye to rest. Even the tape to fix the eye-pads is in the module box itself. Alsco ensures that the caregiver does not waste time looking for things required to treat the injury. Not only is the kit intelligently organised for the ease of the users, you do not have to bother about re-stocking the supplies. Alsco takes care of it. So make sure you choose the kit that not only is the choice of the first aiders but also makes safety and first aid easier for you. Start your Alsco First Aid Kit rental today.